Whether its existing urban areas in need of an upgrade or urban architects eager to get their designer lens atop a new locality, successful planning of urban streetscapes and shared spaces are the backbone of neighbourhoods and public realms. The successful projects feature unique open areas suitable for pedestrians, cyclists and commuters to roam, connect and breathe. Urban public areas, in particular, should hold great cosmetic appeal on top of functionality where our favourite districts appear to take on a life of their own. In addition to this, where we choose to spend our leisure time becomes apart of our own cultural and community identities, so the desirability of an urban environment is a huge factor for governments and businesses looking to secure return visitors to any one area. Sprucing up an area or giving it a dose of 'beautification' can ensure that space facilitates harmony and beauty, connection, community spirit and identity among its users. In particular, a thriving public domain can contribute to the relationship between its visitors as well as their accessibility to, and ease of movement throughout an area. Urban public areas need to be compatible with existing establishments and spaces, so designers often include indigenous and natural plantation where possible. They are also required to cater for a wide variety of activities and receptors, therefore designers need to consider giving an area a diverse contextual appeal. This may include provisions such as bike racks, drinking fountains, play areas, dog bowls, trees, attuned lighting and landscaping. Ease of access to businesses and retail buildings, as well as signage necessary for maps, services and parking, should also form part of the brief. Furthermore, if an urban environment has historical or symbolic characteristics, its design should preserve the originality and distinguishing features of an existing area. This gives a place a soul providing great emotional appeal. When it comes to designing an area that will last, there are many considerations for the urban planner or landscape architect. Naturally, any construction will impact upon locals and visitors, so limiting its inconveniences, or communicating them while under development can help retain public confidence. Other obstacles, such as steep topography, can present many challenges but can be transformed into a feature element with liveability within the streetscape. A pavement can act as a visual stimulus, but sticking to fewer materials can help the optical fluidity of the surface. While differences can create interest and contrast on the ground plane, having a level change and alignment between different materials, textures or patterns can help avoid clashes and streamline areas for foot traffic. Neutral pavers can break up a transition between two contrasting patterns or materials, or varying the alignment and positioning of pavers changes the perspective of the area. Regardless of taste, a good, accessible streetscape allows neighbours to socialise at meeting points, engage in physical activity, enjoy natural elements while catering for all seasons with awnings and shade options, and creating a pleasant environment to be around that still offers residential and commercial connectivity. Designers should always develop living spaces with elements that are easy to maintain and upkeep. Here at ACO Polycrete, we know how important it is to find the right drainage to reduce the effects of natural elements like rain, stormwater and oils and to find a solution that will blend in with the feel of a designer's visual objectives. That's why we have developed a line of iron grates specifically tailored to be implemented into any urban project. AS 3996, Surface Openings in Pedestrian Areas. AS 3996, Bicycle tyre penetration resistance. AS 1428, Wheelchair and walking cane safety. ACO can guide you through with the right choice of a compliant grate to suit any application. Moreover, we don't pretend we have all the design options to suit every designer's objectives. Instead, we offer a bespoke design service giving the designer full control of the end result. 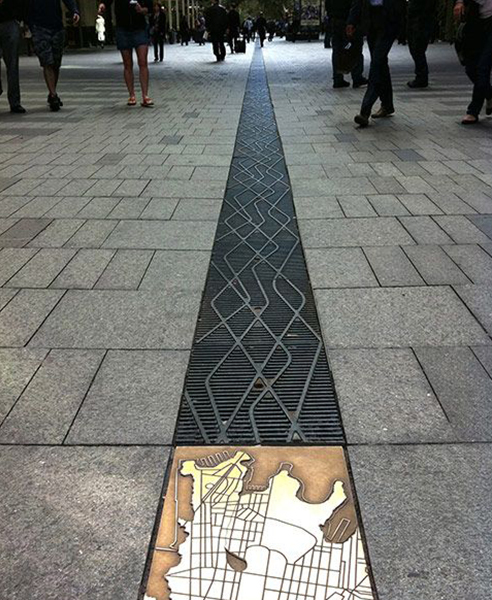 In Pitt Street Mall, Sydney, architects designed a bespoke drain to harmonise with the surrounding urban elements and historical context of the area as well as abiding by WSUD principles. The major refurbishment of the public domain accommodated a central trench drain system where the pattern on the grates visually imitates the trickling of water to remind us of the original underlying Tank Stream. The grates, illuminated from beneath at night, are fit for foot traffic, emergency and maintenance vehicles, as well as functioning to collect stormwater from the pavement and adjacent awnings. The underlying ACO channel then diverts it into surrounding vegetation. In Angel Place, a historical Sydney laneway flanked by heritage sites, restaurants and cafes, ACO supplied a bespoke drain system to complement the industrial look of the iron, steel and granite elements for a stunning visual display. ACO ensured the grates were robust enough for the service vehicles and waste removal trucks that would frequently use the laneway. 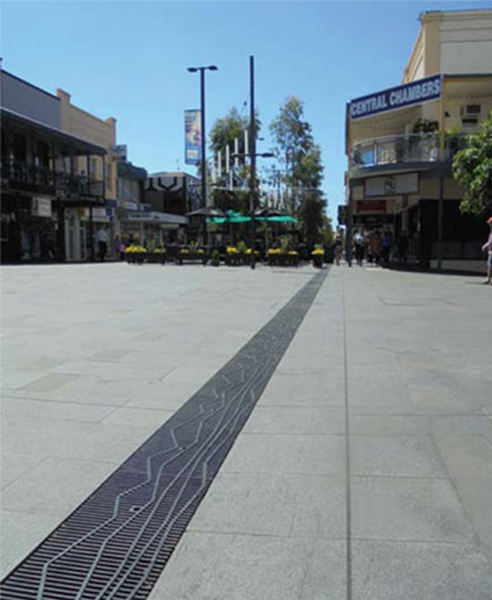 In Crown Street Mall, Wollongong, a sloped drain was used to integrate with the urban environment as well as to provide functional drainage to a flat pavement. A custom-made grate was made to visually mark time with the industrial history of the area whilst offering heel and wheel compliance. Working with a reliable Australian manufacturer ensures that restrictions and disappointments associated with cheap imports are avoided. Expect world-class support that puts the designer in control - from design to manufacture. ACO want you to be happy with your product choice because we know the stakes are high and your integrity is on the line when it comes to high profile projects. The team at ACO are extensively trained to make the process seamless. ACO is an established family owned and run manufacturer who is renowned in the construction industry globally for over 50 years. Headquartered in Western Sydney, we are leaders of manufacturing to bring the best solutions taking Australian and overseas projects to innovative new heights. For more information on our standard or customised grates, visit www.acodrain.com.au.